The Brunel Microzoom has been specifically developed for those wishing to use CCTV with monitor visualisation of image as an alternative to direct use of a microscope. 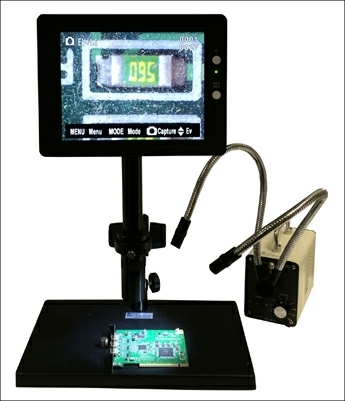 This is an ideal application for electronics and other uses that require either the low power scanning of large areas or reworking and manipulation of components, particularly when used with an HDMI camera that will provide a fast frame rate on a monitor or TV allowing very smooth moving images. 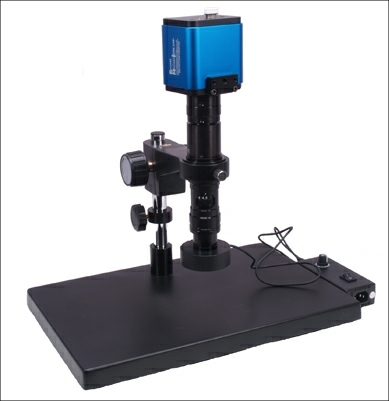 The zoom microscope body has a zoom range of 0.7x to 4.5x. This will provide an overall magnification range with a 14” screen of x15 to x100. The working distance of the unit is 95mm with the x1 objective which is supplied as standard. 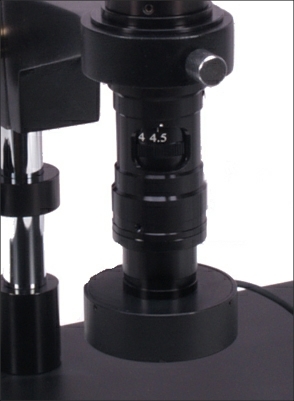 There are potentially four CCD adapters which attach the microscope body to the camera of choice. x0.5, x1 and x2. 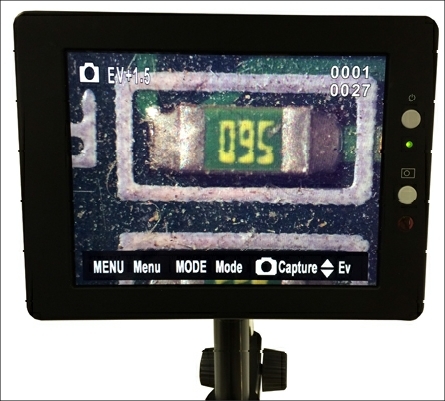 The field of view reduces as the magnification factor of the CCTV adapter increases. We supply the units as standard with the x0.5 adapter which gives the largest field of view. 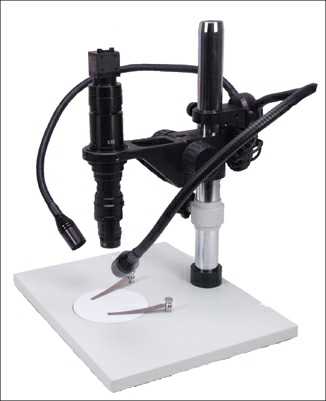 The Microzoom is supplied with a x1 objective as standard. Additional objectives are available with working distances as shown below. 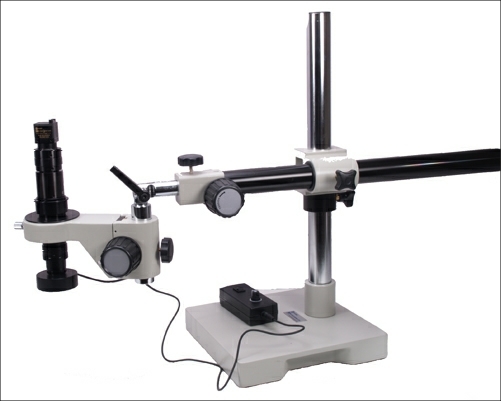 The Microzoom can be supplied on either of the two plain bases shown below or on any of the long arm systems that we have available in our long arm stereomicroscopes range stereo microscopes. If the Microzoom is used for viewing moving objects, we would recommend an HDMI unit. Digital streaming cameras also have their place. We would be pleased to advise. There are three options for displaying the image. When used with an independent camera the choice will depend on the type. HDMI cameras would require a Monitor or TV screen with an HDMI input port. This would also be the case for a digital SLR camera with an HDMI out option (Canon, Nikon etc). Both types of HDMI output cameras could of course be directly coupled to a digital projector with an HDMI input port. Digital streaming cameras would need a laptop or PC with USB 2.0 or 3.0 port. The Microzoom can be fitted with a specific ring light as shown in the images below. However there are many other lighting options including a transmitted light source and the choice will depend on the application. The table above shows the combined effect of the various combinations of C Mount Couplers and the Objectives on the zoom magnification range and the field of view. These may vary to a degree depending on the camera chosen and its chip size.